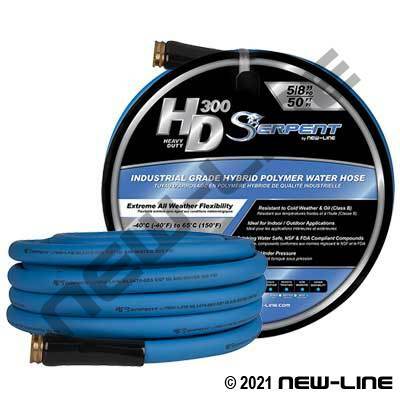 The HD300 Serpent is a Heavy Duty Industrial Grade Hybrid Polymer Water Hose. With a durable heavy duty cover allows this hose to be used in extreme working conditions. Flexible and kink resistant in both hot and cold environments, and made from NSF/FDA compliant compounds making this hose drinking water safe. With a working pressure of 300PSI and a 4:1 Safety Factor allowing it to be used in Air applications with the correct hose end configuration.